Some clouds. Low 56F. WSW winds shifting to SE at 10 to 15 mph.. Some clouds. Low 56F. WSW winds shifting to SE at 10 to 15 mph. “I got a lot of things to say inside me,” says South Tucson artist Melo Dominguez, who has created exhibit space in her Galeria Mitotera for local artists shut out of museums and galleries. in South Tucson. She exhibits her work and that of local artists. Giving back to the community is central to her work as an artist. Melo Dominguez in her Galeria Mitotera on South Fourth Avenue in South Tucson. She wants the gallery to be a place where other artists who are shut out from museums and galleries. “That’s been a long standing issue,” she said. Not long after Melo Dominguez arrived in Tucson from her hometown of Los Angeles, the artist became very ill. She was hospitalized for eight weeks and couldn’t draw or paint as she slowly worked her way back to health from chronic pancreatitis. In her own personal way, like many people around these parts, she made a manda, a promise that one makes — and keeps — to a saint, a spiritual force or la Virgen de Guadalupe, seeking intercession and a cure. “I prayed with all my might that I would give my days to people and service,” said Dominguez, who 11 years ago came to Tucson with her wife, Melissa Brown-Dominguez, a real estate agent. Dominguez regained her health and since then has strived to keep her vow by creating art that speaks to issues close to her heart, and that reflects the trials and values of her adopted town. The Chicanx artist is doing that through Galeria Mitotera, which she opened late this summer on South Fourth Avenue in South Tucson. We talked last week at her gallery, where she presents her art and that of other local artists and which doubles as her art studio, across the street from Mi Nidito restaurant. 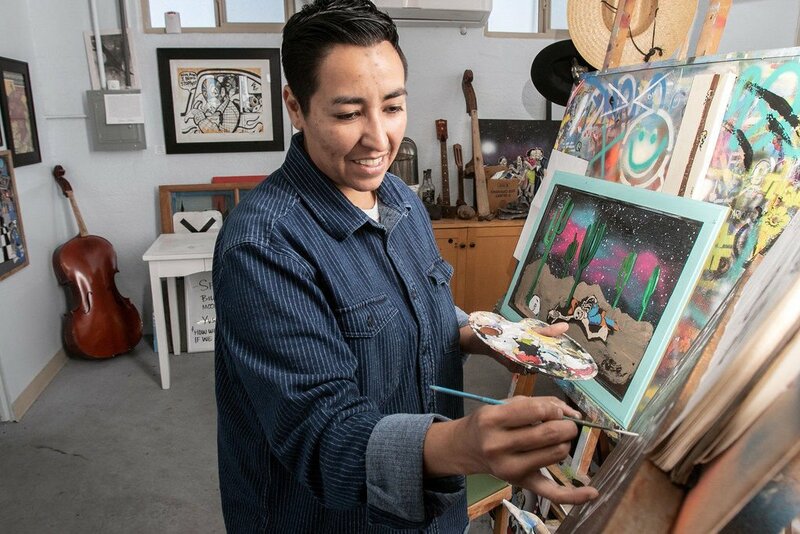 Surrounded by her works, with themes of migration, cultural belonging and being Chicanx, there are the paintings by Gonzalo Espinosa, and the brightly painted and leather-bound guitars created by Antonio C. Estrada. Recently, Dominguez worked with kids at the John Valenzuela Youth Center in South Tucson on the Stash the Trash project, in which the youths painted trash cans to promote a healthy environment and barrio pride. Moreover, by opening up her gallery, she creates exhibit space and opportunities for local artists who are shut out from museums and galleries. “That’s been a long-standing issue,” she said. “You gotta wait in line to get into the museum. You gotta go to X amount of years to school to be admitted. And you know what? Some of us artists don’t got time for that. We’re trying to survive,” she added. Her artistic life began doing graffiti in Los Angeles. That art was attainable for her. Her graffiti days were part of a tumultuous period of her life. She was homeless for a time. Life at home was hard. She was still growing up, she said. She had graduated from a graphic arts program but quickly found doing computer-generated art boring. She needed a different stimulation. She went back to what was important: producing art by hand. Then Tucson beckoned. But the timing was not ideal: the economy had crashed, ushering in the recession. “Tucson looked like the walking dead,” she said. There were no art jobs. She didn’t have a network. She took a job driving a tow truck. Then came her long hospital stay. When she finally recovered, including a two-year rehab period, Dominguez was fired up. She had embraced Tucson culture and discovered its unique qualities. She was also politically motivated. SB 1070 had become state law in 2010, an attack on Latino immigrants and the Latino community as a whole. Migration is personal for Dominguez. Her father was deported to Mexico 25 years ago. “I felt I got a lot of things to say inside me,” she said. She went to work. Dominguez found exhibit space at Fragment Gallery on East Toole Avenue and the Tucson Tamale Co. on East Broadway, where she became the resident artist. People began to buy her work. She also placed her artwork in Pop Cycle on North Fourth Avenue, and when she won an artist competition at Dinnerware Artspace, she invested the $500 prize money into youth arts projects. In 2012, the Tucson-Pima Arts Council nominated Dominguez as emerging artist of the year. One of her bigger breaks came when she landed a gig with Biosphere 2, north of Tucson, in which she joined with artists from across the country and two from Uruguay to create art in relation to climate change. It was a huge leap. “It was insanely amazing. I’m a Chicanx from East L.A. ... and a stoner graffiti artist talking about social/political issues,” Dominguez said. Quiroz, who retired in May as a tenured professor of art at the University of Arizona after 30 years, said Dominguez is astute in her work, incorporating strong Chicano themes. 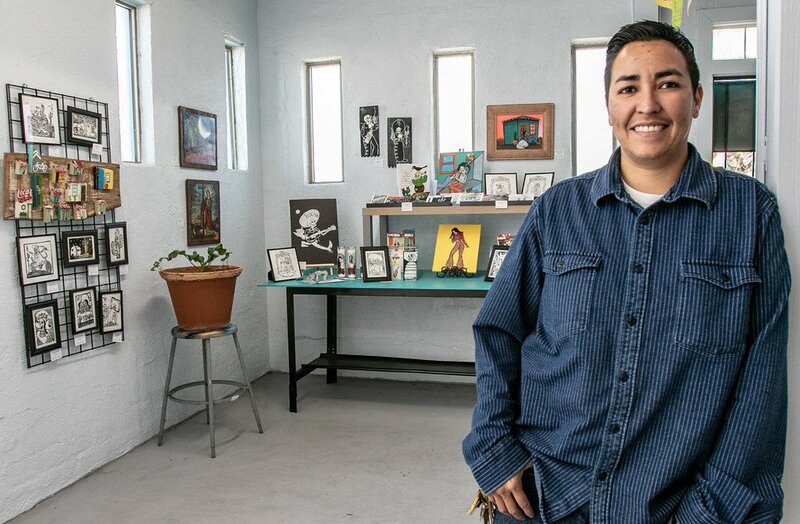 He owns the building where Dominguez rents her space, and Quiroz said it is their intent to build an artistic colony in South Tucson and help bring positive change. That fits into Dominguez’s long-range vision for herself and her work. She acknowledges that she was blessed with opportunities that others gave her in Los Angeles and in Tucson, and understands the need to pay forward. It will be a proud achievement for muralist and his collaborator.